Mum send me this, which then I forwarded to my husband. He laughed and replied, "That makes two of us"
Indeed. Clothes for Sofia keep on coming, either from friends, relatives, or even from us. We had to buy her new clothes or she would end up like a sarung nangka, like mum would call it. Seriously, I read a lot of articles on things to get before the baby arrives but only one stated, BUY NEW CLOTHES FOR YOURSELF. I only found the article after I gave birth to Sofia, and seriously, that is the most useful advice I've ever known. Except the fact that I found out about it late. Gifts for the baby will keep on coming. Seriously, a lot of people came to visit but everything they brought was for the baby. Baby clothes, baby shampoo, baby socks, baby shoes, even pacifier. Oh, and diaper bag. Seriously, I had about 5 diaper bags. If you plan on breastfeeding, buy nursing clothes in advance. Because seriously, no one knows your taste. The design, the colour, the cutting... My husband and mum were kind enough to get me nursing clothes, but I didn't really like the design. Ee tak bersyukur! 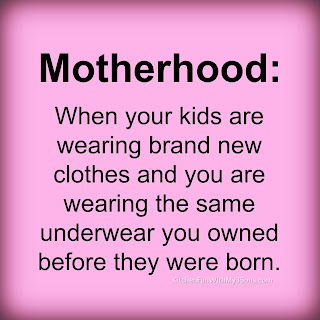 But seriously, it is better to shop for clothes before the baby arrives. There was this one time, I was so desperate for new clothes that I just grabbed it. I already tried it on (despite Sofia starting to look uneasy, lama sangat berjalan I guess) and realized that it was a bit too big. But I bought it anyway, thinking it is now or never. HAHAHA. Baik beli kalau tak langsung tak ada baju baru. One, is because of the time limitation. Two, is because you are a mother. If not for time constraint and all (can buy online meh), it is because once the baby arrives, you are automatically a mother, and in my husband's case, a father. Well, because the title of this blog post is 'that makes two of us'... Once you became a mother and a father, somehow the attention shifts to your little one. Everything revolves around this new creature in your life. Nearly 6 months of bringing up Sofia, I noticed both of us tend to forget about our needs and wants. I might complain of not having proper clothes for a kenduri, but when the time comes to shop, I didn't get myself new clothes pun. Same goes to my husband. Only thing is, he didn't really need new clothes... Like, who's nursing here? Obviously I'm the one who need new clothes. Aih... I really miss wearing t-shirts. Anyhow, reading this post, busted lah laki bini ni lama tak berganti pakaian *ahem*. Hahahah. Oh parenthood. sya buat experiment buy 1 @ 2, bile dah jumpe yg fit cantik+selesa, hamikk, memang asal sale je sampai la parcel lazada kt umah. Hahahahah! Bab badan dah okay tu yang win. Betul. Sebenarnya agak malas nak beli baju pun sebab saiz dah berubah... hahahhahahah! hahaha betul babe. baju BF tu semua seeloknya shopping masa shopping barang baby sekali. taste kita lain kan.